Indiaplaza Blog For smart shoppers |: David Baldacci's "Deliver Us From Evil"
David Baldacci's "Deliver Us From Evil"
Indiaplaza Eclusive: Pre-Order David Baldacci's "Deliver Us From Evil" at 20% discount! 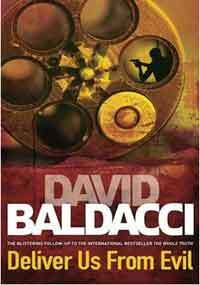 David Baldacci is the author of fifteen previous consecutive New York Times bestsellers. With his books published in over 40 languages in more than 80 countries, and with nearly 70 million copies in print, he is one of the world’s favourite storytellers. In South America a wealthy ninety-six year old man reads a book late into the night. Within an hour, he is dead, the secrets of his past starkly revealed. Six months later, in Provence, Shaw -the shadowy operative from from The Whole Truth- witnesses the murder of a mysterious man, his body left lifeless at the bottom of a pool. Shaw barely escapes the incident himself; and with a new partner in tow, begins to realise that there has to be another organization at work that rivals his own in secrecy . . . Meanwhile, half a world away, journalist Katie James is working on a story of international importance. But shortly after meeting with a potential inside source she is smuggled unconscious onto an aeroplane, headed to an undisclosed destination. In the days to come, Katie and Shaw will be reunited in a deadly dual of nerve and wits against a surprising, secretive enemy and lead around the world at a breakneck pace. Filled with the breathtaking plot turns and remarkable characters that only David Baldacci can deliver, this is the most explosive thriller of the year. EXCLUSIVE INDIAPLAZA OFFER: Pre-Order David Baldacci's "Deliver Us From Evil" at 20% discount!